The Navigation Grey is a catamaran boat that operates from Hotel Lago Grey in Torres del Paine. Passengers must have a pre-paid ticket and check-in at the Hotel Grey at the time specified. Passengers will then be required to walk a few hundred metres to the embarkation point, however, at certain times of the year when the water level is too high or too low passengers will be required to walk through a wooded area and along Grey Beach. If a walk along Grey Beach is required it will NOT be suitable for people who have any kind of mobility issue. Once onboard the navigation begins in a small inlet and takes in the length of Lago Grey passing by any icebergs that are floating in the lake. On a clear day the surrounding scenery is spectacular with views of hanging glaciers and snow-capped peaks around the Park. After about 45mins the boat will reach the drop-off point for people going to, and coming from, refugio grey. Once other passengers coming from refugio grey have come aboard the trip continues towards Glacier Grey, passing by the face of the glacier. Here, in the face of the glacier you will see the stunning spectrum of blue-coloured ice and jagged ice peaks, and hear the crack and rumble of the glacier splitting as it moves. The lined walls of the mountains will show clear evidence of the glacial forces that twisted and scratched lines onto the rock. 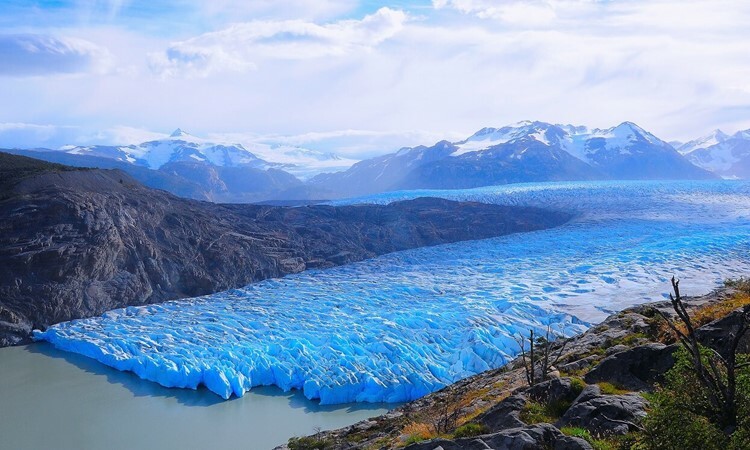 It is a great opportunity to see a Patagonian glacier and experience the true beauty of this part of the World. ExperienceChile.Org offers to include the Navigation Grey as a return trip from Hotel Grey or a one-way trip from Hotel Grey to Refugio Grey or a one-way trip from Refugio Grey to Hotel Grey as long as it is part of the rest of your itinerary that we are arranging. We do not offer this as a standalone reservation. In Patagonia the weather is unpredictable, one day it is calm and warm and the next it can be blowing “hurricane-force” winds, cold, wet and rainy. Therefore the scheduled navigation times from Navigation Grey can be interrupted at short notice. 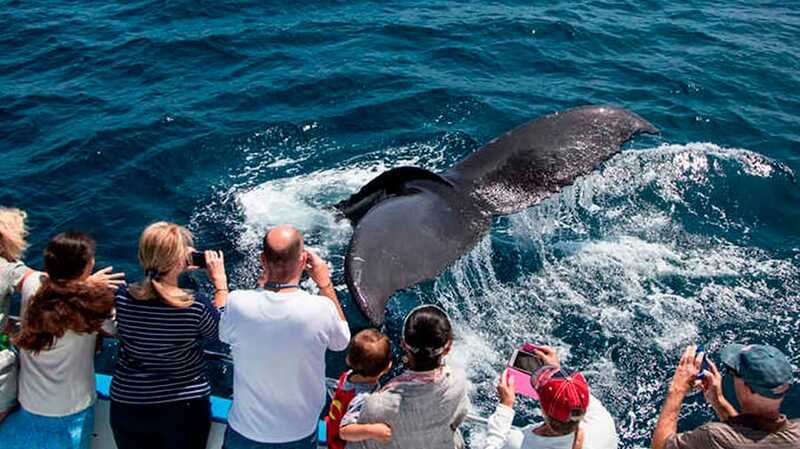 In this event we have the following options whereby your itinerary will be adapted. If your trip is from HOTEL GREY to REFUGIO GREY you will be taken to PUDETO from where you can board the catamaran that crosses Pehoe Lake to Refugio Paine Grande. You will need to pay for the catamaran on board, approx USD30 per person. From Paine Grande the hike to Refugio Grey is approx 4hrs. If your trip is from REFUGIO GREY to HOTEL GREY you will need to hike approx 4hrs to Refugio Paine Grande to take the catamaran at 11:30hrs OR 17:00hrs across to PUDETO. You will need to pay for the catamaran on board, approx USD30 per person. At PUDETO the private transfer will be waiting for you. Take a warm jacket, warm hat and even gloves as it can be quite cold when the wind blows down off the frozen ice. Note that this service is subject to local weather conditions and when there is too much wind it will not operate. Included: Pisco, with ice from the glacier (made thousands of years ago). We can build this activity into the rest of your itinerary. 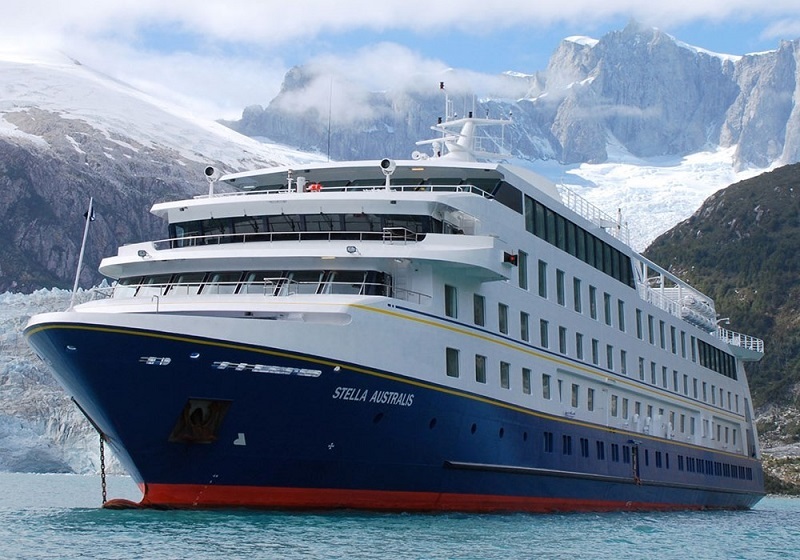 It will require either a private transfer from Puerto Natales and / or back to Puerto Natales, unless you are going somewhere else in the park. 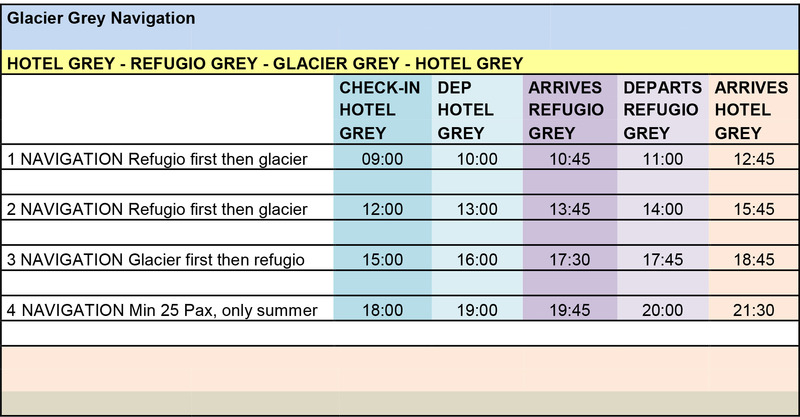 The Navigation Grey operates as a return trip from Hotel Lago Grey, or a one-way trip from Hotel Lago Grey to Refugio Grey, or a one-way trip from Refugio Grey to Hotel Lago Grey.